Essex Winter Landscape is a subtle, carefully designed picture from Bawden’s early years working in Essex prior to the Second World War. The scene is viewed from the corner of a field and looks across to houses and partially weatherboarded farm buildings. The trees at the edge of the field are barren and leafless, suggesting the seasonal cold. Though overcast and depicted in neutral tones, the sky above is constructed from a technically accomplished mesh of thinly-applied and carefully controlled washes. Beside the upper reach of the tree in the centre ground, a sequence of three subtly graded grey tones create a delicate atmospheric effect. A wash of warm red-brown and green colours creates a layered background among the houses and trees. The distant green horizon is overwritten by pallid, leafless red trees, creating a rich chromatic effect. Indeed, Bawden’s washes are so carefully controlled that the effect is exacting, demonstrating a high degree of professionalism in watercolour which distinguished him from his contemporaries. In 1932, Bawden and another artist, his friend Eric Ravilious, acquired a red-brick Georgian house in Great Bardfield, Essex, near Bawden's childhood hometown of Braintree. Between 1932 and 1935, Bawden split his time between Great Bardfield and a flat in Hammersmith, spending the week in London and the weekend in Essex. The bucolic Essex landscape and the rural aspect of Great Bardfield was deeply appealing to Bawden, however, and in 1935 he moved there permanently. All of his watercolours between 1935 and 1939 reflect his involvement in the Essex countryside and the surroundings of Great Bardfield, and his watercolours from this time, including this work, represent Bawden’s most distinguished contribution to the English landscape art tradition. From 1935, his output developed a decidedly place-driven quality, and in his paintings he developed a characteristically muted colour tonality, composed chiefly of subtle greens and greys, which makes his work recognisable as his own, while at once capturing the pleasant, staid landscape character of East Anglia. In the years prior to executing Essex Winter Landscape, while living and painting in Essex, Bawden had developed a considerable maturity in his watercolour practice. This work displays his fastidious craftsmanship and an exacting sense of design. His training at the Royal College of Art, which he concluded in 1925, was centred on various aspects of graphic design and draughtsmanship, and this is apparent from the pattern of brushwork in the surface of the work. The tree trunk in the foreground, for instance, is composed from a precisely executed sequence of parallel strokes, five deep at the trunk’s widest girth. 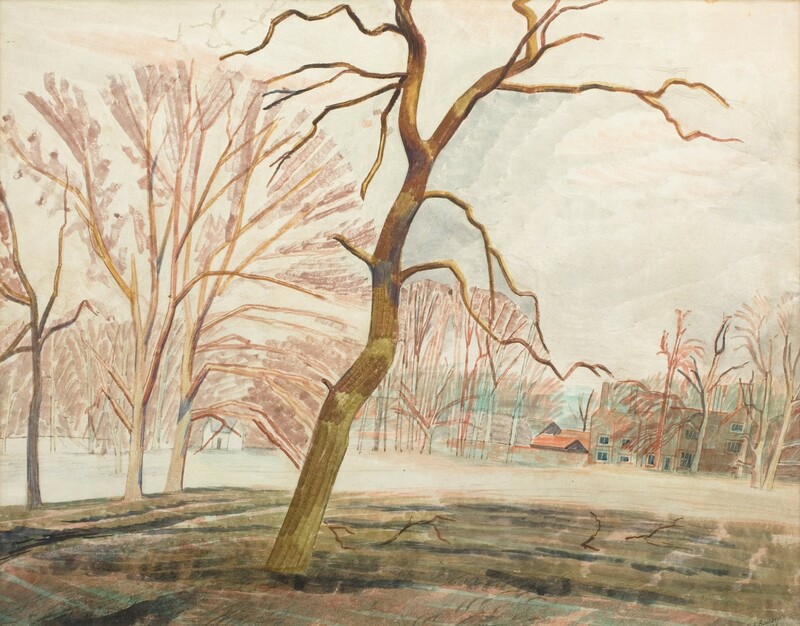 While studying at the Royal College he was tutored by the artist Paul Nash, moreover, and something of Nash’s rigorous design skills and delicate colouring are apparent in this work. The work is comparable to contemporary output by another friend of Bawden’s, the painter John Aldridge, who also lived in Great Bardfield. Both men were keen gardeners and, as neither man travelled much outside of Essex during this period, their work from this time is closely stylistically connected. Aldridge’s painting Great Bardfield (1938, Bangor University), for example, is directly akin to Essex Winter Landscape, catching the same mood with its weatherboarded and red brick buildings, warm tiled rooves, and plaintive green field and grey skey. In the same vain, Essex Winter Landscape itself is a fine, characteristic example of Bawden’s watercolour painting made in the late nineteen-thirties. As with the best work by Aldridge, it represents an Essex pastoral, with vivid, carefully-executed patterns and washes, and conveying a charming sense of place with accomplished professionalism.